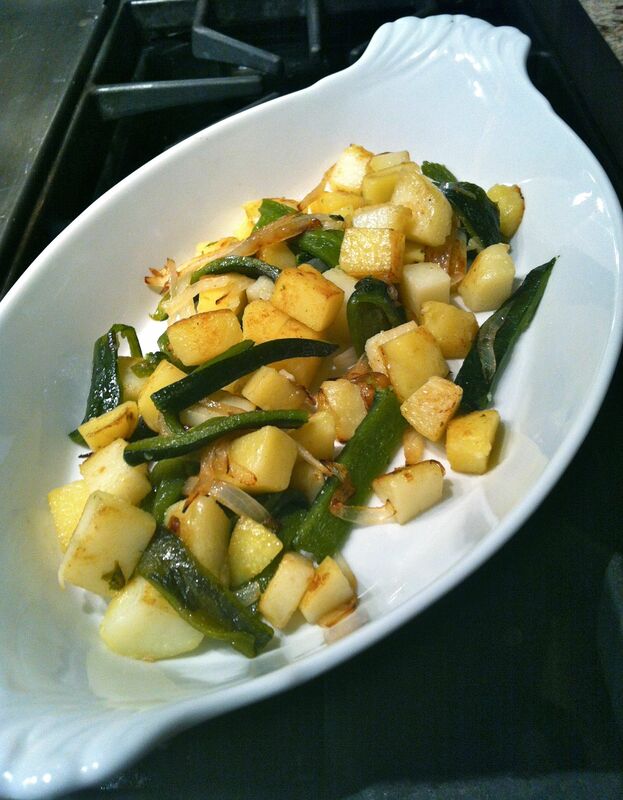 In this wonderfully creamy dish, Papas Con Rajas (Poblano Chile Potatoes), the traditions of Peru and Mexico are brought together, potatoes being native to Peru and the poblano chile native to Mexico. Early archaeological evidence of the potato is found in excavations near the town of Chilca, just south of Lima, Peru and dated more than 8,000 years ago. Amazingly, there are over 2,300 varieties of potatoes in Peru. It’sis an important culinary ingredient of the Incas who used elaborate preparation techniques that included alternatively pressing, drying and then freezing. Combining Poblano chile strips, rajas, adds aroma and sizzle to this dish, and I think you’ll find this combination a delicious one. Just make sure that you use a waxy potato and not a flaky or russet type. 4 small waxy potatoes, peeled and cut into 1/2-inch cubes (about 2-1/2 cups). I like Yukon gold, but you can use any kind except russet. 1. Place the chiles under a broiler, turning them so that they are entirely charred and the skin blisters. Place them in a paper bag, close tightly, and let them sweat for 15 minutes so that the skin will be easier to peel off. Note: This recipe is adapted from the book: “Truly Texas Mexican: A Native Culinary Heritage In Recipes” published by Texas Tech University Press.